5x2 wattt stereo amplifier circuit using BA5417. Operates from 12V DC. 5x2 w output into 4 ohm speakers. BA5417 is a stereo amplifier IC with a lot of good features like thermal shut down, standby function, soft clipping, wide operating voltage range etc. The IC can deliver 5W per channel into 4 ohm loud speakers at 12V DC supply voltage. The BA5417 has excellent sound quality and low THD (total harmonic distortion) around 0.1% at F=1kHz; Pout=0.5W. Setup and working of this stereo power amplifier circuit is somewhat similar to the BA5406 based stereo amplifier circuit published previously. C10 and C11 are DC decoupling capacitors which block any DC level present in the input signals. C2 and C6 couples the amplifiers left and right power outputs to the corresponding loud speakers. C1 and C5 are bootstrap capacitors. Bootstrapping is a method in which a portion of the amplifiers is taken and applied to the input. The prime objective of bootstrapping is to improve the input impedance. Networks R1,C3 and R2,C7 are meant for improving the high frequency stability of the circuit. C4 is the power supply filter capacitor. S1 is the standby switch. C8 is a filter capacitor. R3 and R4 sets the gain of the left and right channels of the amplifier in conjunction with the 39K internal feedback resistors. 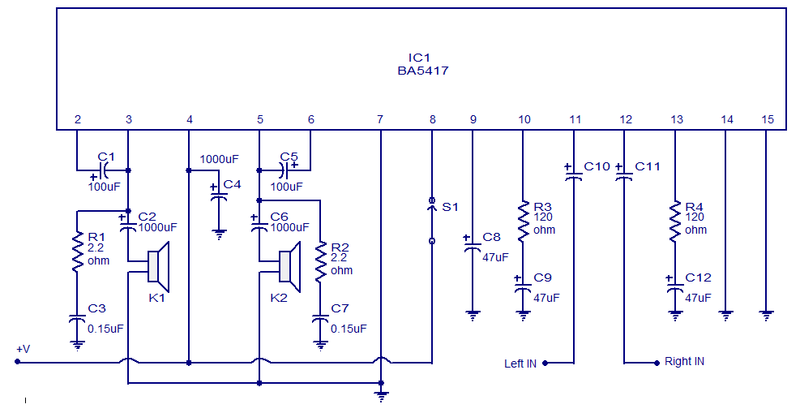 Supply voltage range of BA5417 is from 6 to 15V DC. The recommended supply voltage for this circuit is 12V DC. The circuit can be assembled on a perf board without much degradation in performance. Few other stereo amplifier circuits that you may like. BA5406 stereo amplifier circuit : Simple stereo amplifier circuit that can deliver 5 watt per channel sound output into a 4 ohm speaker. Operates from 12V DC and requires very few external components. Suitable for low power car audio applications. TDA1554 stereo amplifier circuit: Â A very popular stereo amplifier design. This amplifier can output 22 watts per channel into 4 ohm loud speakers. This circuit can be also powered from 12V DC. Low distortion and noise. 2×32 watts stereo amplifier circuit : High quality stereo amplifier design using TDA2050 IC. The circuit requires a +/-18V DC dual supply. Power output is 32 watts per channel into 4 ohm speakers. Stereo amplifier based on TDA4935 : A stereo amplifier design with a lot of great features like over load protection and thermal shut down. The power out put is 2×15 W into 4 ohm speakers. Operating voltage is 24V DC. Potentiometers for controlling the volume is also included in the circuit. 120W stereo amplifier circuit : A powerful stereo amplifier design using LM4780 audio amplifier IC from National Semiconductors. operates from a +/-35V DC dual power supply. 2×60 watt power output into 8 ohm loud speakers. The circuit has good power supply rejection and also there is a built in mute circuitry. Can please tell why 25 volts electrolytic capacitor ??? ic ba 5417 is very very hot and only one channel is ok. is the ic is faulty? if yes ca i have a replacement for this ic? who would tell you that there are those triangles down the scheme? They are earthing or cons ? can is use with arduino bro? Pin No 8&4 are positive 7 is common (-ve)pin no 11 & 12 are left and right signal input. Pin no 3 & 5 are speaker output. Pls what is the value of C11 and C12? C10 and C11 are 2,2uF. This design is from BA5417 datasheet. And one more question, what is the value of C10 and C11? Hey, I’m trying to build but I was curious on the specs of the components needed. I imagine voltage on any component must be greater than the voltage of my power source, so the lowest voltage capacitor I’m using is rated for 25v and I’ll be using a 12v power source. Additionally, what wattage must the resistors be rated at? could I assume that R1 and R2 must be able to handle 5 watts because they are on the same lines as the speakers? My final question is regarding the speakers. I understand that when using a circuit that accommodates 4ohm loudspeakers, using 8ohm speakers will be safe for the circuit, but is there a way I can optimize the circuit for 8ohm speakers instead? I think the title of the post should be 2x5w stereo power amplifier not 5x2w.